Your canine Einstein will really enjoy the IQ Treat Ball. It’s smartly designed so that you can adjust the access, making it easier or more difficult for your dog to reach whatever delicious delicacies you hide inside. It’s a unique, roly-poly puzzle that’ll keep your pooch busy, happy and moving. One of my dogs the German shorthair pointer played with the ball for a long time . The other dog the Weim after 15 minutes tried to break it open, however he failed. I was impressed since he can chew up everything, but not this ball. He is know as the USS destroyer! Love it. Kept my Border Collie occupied for a few moments. Now to let the others have a shot at it. bought this for my neighbor's Boston Terrier pup. He loves it! The treat ball was exactly as described. Haven’t been able to use yet as the puppy has just arrived. Love the concept. I bought two IQ Treat Balls for my two German Shepherds. In less than an hour they were both destroyed. Not for big dogs or dogs that can chew. This toy worked fine in that it dispensed treats based on your dog's ability to roll the ball around and get the treats out of the dispensing hole. However, my dog was able to chew the ball since it was small enough for him to get into his mouth, and he ended up breaking the cover. I think this would be ok if you have a smaller dog that didn't bite so hard, but mine (yellow lab) made short work of the toy. Maybe I'll try for the bigger size next time. The only real problem is that my dog rolls it under and behind things and I have to get it out! Otherwise, it is a decent toy. It could be stronger and maybe a little bigger to avoid getting stuck in some of the places it gets stuck in. I like this toy. The dogs have to work to get the treats or food out, and it is big enough that the dogs can't get a good enough grip on to bite down and break. We have multiple big dogs and finding durable toys is a challenge. My puppy loves this toy! This is my 15 week old puppy's favorite toy. I'm hoping it will continue to entertain her for a long time to come. My baby smoky love to play with iq treat ball and love to see treat fall out from ball and eat treat. It is rally fanastic toy to keep her busy than her own ball. It is unique toy. It is very good product. 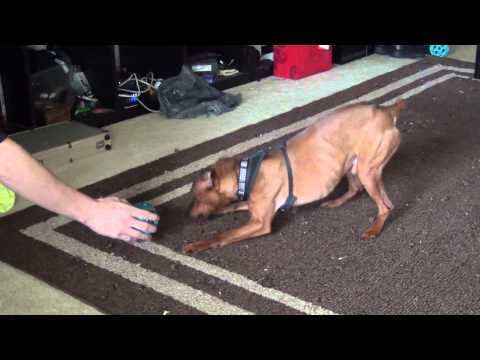 My Boston Terrier puppy & I really like this treat ball! Even the CAT uses it!!! My Boston Terrier puppy eats about 60% of his food out of the IQ Treat Ball. He has it completely figured out at 8 weeks, and will roll it around for quite a while eating his kibble out of it. Even my CAT will roll this around to get freeze dried liver bits out of it. I have a ten pound Silky Terrier and I bought the medium size thinking that would be a good size for him. On the package it says that the ball should not be able to fit in the dog's mouth and I thought this would be a good size for a small dog. He just spent the whole morning carrying the ball around my house in his mouth. He seemed to have fun with it and I was glad to see him worn out by the end of meal time. I also bought a Large size for my parent's Golden Retriever but if he can fit it in his mouth it won't last long. This toy is very noisy on hard floors. My dog loves this toy and it keeps her busy. my dog (min pin) was abe to open this. I'm not sure, but he is able to unscrew it and get all the treats! Murphy (a black Lab) cornered the ball and had the top popped off within minutes. The second try I put him outside with it and by all the tumbling, he unscrewed the ball. Disappointing. Probably better for a small dog. My two dogs love this toy - especially when I put Bil Jac liver treats in them. I bought two, one blue and one orange, for them and while they quickly figured out how to work it, they don't seem to get bored of it. My only concern is it fits in their mouths - my 70 lb shepherd mix figured out how to grab and bite it so the pieces pop apart for the times when he doesn't feel like rolling it around. It hasn't splintered yet, but I feel it's too easy for the pieces to come apart. I don't use it as often as my other rolling, treat dispensing toys (like the Kong Stuff-a-Ball) now for fear one day it will splinter. But, I gave one to a friend with a hyper Yorkie and she loves it. i just got this in the mail yesturday and my black lab loves it! chased it all around the house all night even with no food in it, my 13 year old border terrier also liked it once she figured out food came from it. i would recommend this product to anyone. i've thought about getting one for my sisters new puppy. the one thing i didn't like was how both my dogs could pick it up. the good things though is is SUPER easy to fill. and i like how you can make it easy or hard on the levels. but other than the being able to carry it around its a really good toy to keep them busy for a while. I bought this toy for my dog who does not play with any toys and I thought a treat might encourage him to play. At first he tried to bite the plastic to crack it open, which he almost did, but then I showed him how to roll it around to dispense treats. Now he plays with it for hours. I wish it was more sturdy because he could easily bite the plastic to crack into it. My dog had so much fun with this treat ball...for about 2 days. After he figured out how to roll the treats out, he took to a simple method by easily chewing apart the plastic top. One crunch was all it took and the plastic shattered into pieces. It's a shame because it was a great interactive toy. Our Chihauhua gets bored when we're gone during the day, and when he gets bored, he eats carpet. We had a few food toys, and they worked great, but he was getting bored with them and he had figured out all of them, so we purchased two more to help keep him busy. We purchased the medium IQ ball, and he LOVES it. We have carpeting, and the first day we played with it with him when we were home and he caught on very quickly. We have to put his dog food, and small treats in there for him. If we place just the regular food, he isn't interested. We crumble up a few treats, and he loves to roll the ball and "gamble" to get a yummy treat. When we go to leave the house he just sits and waits for us to put this toy down, and he is playing with it before we even close the door. Our chihuahua had figured out his old toys, so we purchased this one because we thought it was a puzzle inside which can be made harder. The opening can be set to harder or easier, but there isn't a puzzle inside like the other toy we purchased.There are two holes for the food to travel through. The first hole is settable in size, and brings the food into that clear colored area where they have to then push it out a second, non-size changeable hole. That said, he still loved it and since the first hole can be made smaller, it's still challenging enough for him. It's working great and we aren't even on the hardest setting yet after two months. Our Chihuahua is 10lbs lean, so it's great for a dog his size. I would have given this product a 5 star if I had known there wasn't a puzzle when I purchased it. The way I understood it, there was puzzle traps inside to make it more difficult. Great toy though. I have a husky/puggle mix (yes I know very bizarre mix) but her personality is very husky so she is a methodical destructor!! Stuffed toys last at most 5 minutes with her, even those that are guaranteed to last. Also, the beagle and husky in her make her way too cleaver for me!! I have never had her play with a toy by herself, let alone do it for hours on end day in and day out. She has finally met her match and I cannot tell you how much I appreciate the hour I get to relax while she chases her IQ ball around eating up every treat and kibble. THANK YOU THANK YOU THANK YOU!!!! I got this toy for my Yorkie, but gave it to a friend with a papillion who was nervous, destructive, etc. He loves it, and enjoys treats from it (he could use a few pounds) I'm gettting two more...what else can I say! I purchased this for some extra stimulation. Looking for a toy to keep my Weimaraner amused during the day. Thought my dog would like but he didn't even try. My dog loves this toy. They last about 4 months... so buy a few. For the price, it is a good value. Its my dogs favorite toy. She has bounced it down the basement steps onto the concrete floor & it hasn't cracked. It's also very nice that the opening for the treats can be varied. Great toy! I work in an animal shelter and these have proven to be a favorite among both small and large dogs. Not recommended for heavy chewers as the plastic is not super heavy duty. Daisy loves to find treats in these! the noise that the toy makes (it's plastic) can deter a dog from enjoying this puzzle, especially on a hardwood surface. However, if you introduce the toy on carpet, they will quickly learn it's mechanic. okay. I wish they held more food. Fills fast so if feeding a full meal to a dog who eats over half cup of food you need to use another toy. Other than that they are a nice challenge level. Tons of great reviews and should keep a hyperactive, ADD/HD dog occupied a while! dog has to WORK to get treats out! Interactive design, keeps smart dogs busy. Have a mentally bored corgi. I'm giving these treat balls to my local animal shelter. I have one for my own dogs and they really enjoy rolling them around the house. Its durable for my bully breeds and shelter dogs will enjoy the activity in their kennel. Got good reviews - looking for toys that keep our dog amused for a while. The dogs love this toy. It keeps them entertained for hours.I like to fill it before I leave the house. My puppy has a lot of energy and I need to get things done so I am hoping this will help occupy some of his time! Our labs love this ball. Easy for older dogs who are not very active. Bought one for my own dog and it was brilliant. This one is a gift for a friend's dog. My dog LOVEs the challenge of getting treats out of toys. This will help keep her occupied while I'm gone. And, I bought one for a friend. Looked interesting. Needed new treat dispensers for my Labs. my boys need mental stimulation so, going to try this before spending money on treat puzzles which are pricey. Because my dog needs to get more exercise. He is treat trained and I think this will get him moving around more. my dogs like this treat and are always loosing it. I am getting several so I always have two on hand while I find the misplaced ones. Have a new puppy and want him to learn to be somewhat independent play, last puzzle ball lasted 17 years and wore out. Looking for toys to keep a 1o month old puppy busy! the double sections and ability to get the treats out. plan on using cheerios depending on hole sizes. this is the first time I am trying an IQ toy for my pup, I chose this one because it offers a tough outer shell that can be left outside in the yard and the enticing treats inside will keep her busy for hours. my dog really did not enjoy this because the treats I used were almost impossible to get out but I think it is just because I used to big of dog treats. My Doggie loves this. His is broken. To see if my dog likes it. When I purchased this item last December as a gift for our son's 8 mos. old Aussie, it was the orange treat ball. The color didn't seem to bother her, as this was her first experience with this dog toy. You might want to contact customer service and speak directly with a rep to confirm that the item pictured is the color you want. Mine was orange. I found this to be a waste of money anyway. My dog was too smart for it. She would either slam it into the wall or throw it down the stairs to break it open and get all the treats out at once. The boxes are assorted colors, but I did a quick check in the warehouse and we have 5 blue and 1 orange, If you call customer service, they can note the order and ask the warehouse to pick blue. This is the ball I ordered and it is the blue one. My dog loves it too! Would like a yellow color as cat is used to previous ball colored yellow? Point taken. But large size would be too big for Frankie the cat.